It’s been quite some time since Martin Kaymer stood proud, knowing he has won a tournament. That moment came for him in the 2014 US Open, winning his second major and first in four years and finishing off a dominant weekend at Pinehurst No. 2, coming in first way ahead of Rickie Fowler and Erik Compton. The 29-year old German entered 2011 with something of a trophy drought, not winning on the European tour since 2011 and not in the PGA tour since the 2010 PGA championship. But winning the Players Championship last month was a sign of things to come, and he followed that up with a record breaking performance, never leading by less than four shots over the last 48 holes. Kaymer set the 36-hole scoring record by opening the tournament with a pair of 65s. He became only the 7th player to go wire-to-wire in the 114 year history of the tournament, and was one of only three players in this championship to finish under par. 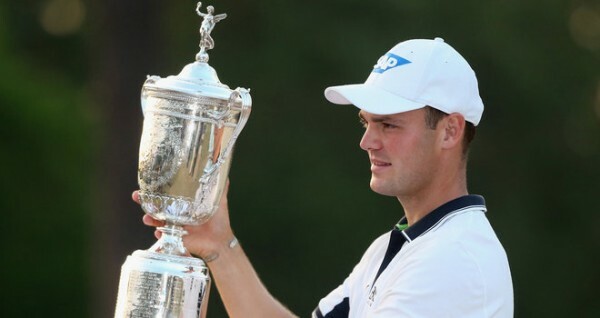 In short, Kaymer was playing in a tournament of his own, isolated from opponents or anything else that might have gotten in his way of winning his second major, not needing a playoff like four years ago in the PGA Championship against Bubba Watson. A late bogey stopped Kaymer from becoming only the third to finish the tournament with a double figures under part, joining Rory McIlroy and Tiger Woods. A 15-foot putt on the 18th hole fell into the middle of the cup, letting his putter fall like it has happened to so many others this week. He finished with a nine under 271. This 2014 US Open ended Friday. Kaymer has led in all the rounds of his last two tournament wins. Kaymer might have let it slip away from him after his historic start, but finished with a 72 that kept him at a safe distance from the rest. He knew the crowd was against him on the fourth and final day, but that seemed to motivate him even further: He shot a 69 this time, which included drilling a driver onto the green on the third hole to end up with a two-putt birdie. Fowler, pushed forward by the crowd, fell away from the challenge on the fourth hole, as a shot that landed in the trees eventually “rewarded” him with a double-bogey. Compton got within four shots as his birdie on the no. 8 put him as close as anyone was to Kaymer during the final day. However, three bogies on a five-hole stretch on the back nine ended any chance of him suddenly turning things around, although he did finish with style on the 18th, making one from 50 yards away, standing on the lip of a bunker. Like Fowler, he finished eight shots behind Kaymer eventually. For Kaymer, this is redemption. He joins Seve Ballesteros, Ernie Els, McIlroy and Woods as the only players with at least two majors and being world number one before the age of 30. It came quite quickly for Kaymer, who fell to the 63rd spot at one point as he spent almost two years on perfecting his game. From being number 63 in the world six weeks ago, he finds himself up to number 11 now. You want to win majors in your career, but if you can win one more, it means so much more. Some people, especially when I went through that low, called me a one-hit wonder and those things. So it’s quite nice proof, even though I don’t feel like I need to prove a lot to people. But somehow, it’s quite satisfying to have two under your belt.